According to Central Bureau of Statistics data released in January 2017, the number of poor people in DIY in September 2016 reached 488.83 thousand inhabitants. This figure was still considered to increase compared to the previous year condition of 485.56 thousand inhabitants in September 2015. While DIY Gini Ratio in 2016 was recorded at 0.425, up from position 0.42 in March 2016 and September 2015. “We call it 5K: kantor, kampung, kampus, kraton, and konglomerasi (office, kampong, campus, palace, and conglomerat). We hope that by synergizing these five elements, the problems being faced can be overcome, especially now, where Yogyakarta is undergoing rapid social, economic, and cultural change,” said Hadna. Changes as results of social, cultural, economic, technology, and information dynamics were common place. Hadna said, Yogyakarta society was currently in the transition process to find their equilibrium point. The previous characteristic of the society were very agrarian, now more diverse. How to make the balance-finding process work well required a serious effort from the government and the role of education. The same thing was also conveyed by the Head of Master and Doctoral Programs in Policy Studies UGM Prof. Dr. Muhadjir Darwin, M.P.A. who assessed that social and economic problems evolved in line with direction changes of development in DIY. The existence of new tourism destinations both in Gunungkidul, Bantul, and Kulon Progo for instance, had encouraged the increasing employment opportunities and income of community. The rural and remote areas which did not have any economic effect before now those stretched and became the leading tourism in the areas. Meanwhile, in urban areas many hotels, inns, and apartments were also built in response to the increase in tourist visits. “However, there are also other social issues, such as traffic jamming, social conflicts between interest groups, tensions between investors and citizens, and other issues which arise as a sign that our society are changing,” Muhadjir said. 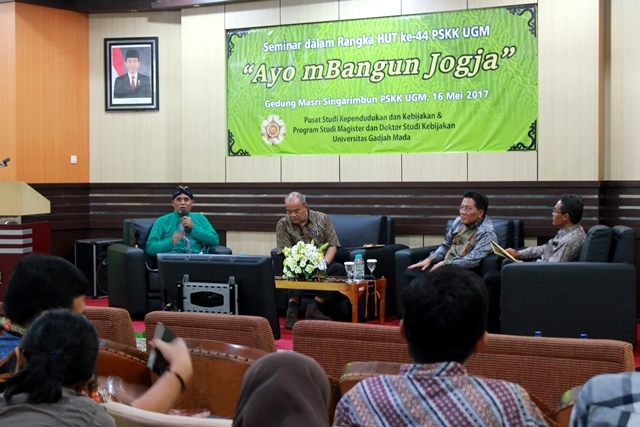 Responding to the various issues of change and problems in Yogyakarta, the Center for Population and Policy Studies of Universitas Gadjah Mada held a half-day seminar entitled “Ayo mBangun Jogja” on Tuesday (16/5). The seminar was attended by the Governor of Yogyakarta, Sri Sultan Hamengku Buwono X who became the keynote speaker. In his speech, Sri Sultan HB X delivered his presentation on the development direction, description, and programs which would be implemented in order to respond the various changes in DIY. Also the Vice Governor of DIY, Sri Paduka Paku Alam X was present detailing the issues in a more technical explanation of government policy measures. Other resource persons were Prof. Ir. Panut Mulyono, M.Eng., D.Eng., as the elected Rector of UGM and Drs. H.A. Hafid Asrom, M.M., an entrepreneur who was also a member of DPD RI. “Through this seminar, there is an expectation that it will bring an action plan of synergism between universities, government, society and the private sector to seriously build Yogyakarta,” said Hadna. Hadna added, the idiom “Ivory Tower” seemed to be still attached to the world of campus. The ability of universities in generating practical thoughts to overcome the problems in society was still weak. Thus, internally, the synergy between educational, research, and community service goals from universities needed to be continuously pursued. Three Pillars of Higher Education must be entirely performed as a whole. In addition to the seminar, there was also the inauguration of Videotron Population Clock by Sri Sultan HB X, Panut Mulyono, and Agus Hadna on the front yard of Masri Singarimbun Building, CPPS UGM. This electronic video facility displayed data on the number of people at the global, national, and local levels, especially in the Special Region of Yogyakarta. At the global level, the source of population data was from United Nations (UN) data, for national and DIY was from Central Bureau of Statistics (BPS). With population projections in a given year, population changes were transferred by the electronic video system into shorter time frequencies, seconds, minutes, and hours. Videotron Population Clock was a part of education for public. Given this population information facility, it was expected that concern would arise as well as awareness of the importance of population issues. Media Center CPPS UGM.